We look at life from such a limited perspective. I call it caterpillar perspective. This is a very appropriate analogy for me. Ever heard of the children’s book, “The Very Hungry Caterpillar?” In essence it’s the caterpillars job to eat. Most caterpillars don’t really eat apples, pears and oranges like the one in Eric Carle’s book, but they do eat a lot. Their focus is on what’s right in front them. Their focus is on eating as much as they cant to get as big as they can. In the caterpillar stage, it’s been said they can eat as much as 2,000 times their birth weight. Caterpillar perspective is seeing only what is right in front of us. For the caterpillar that is the special kind of leaves he loves. For the Monarch caterpillar that is those from the Milkweed plant. He has a great radar for this kind of food and is drawn to it. You could say he has a singular focus for that. Nothing else will do. He also doesn’t look up at the brightly colored objects flitting through the sky. He doesn’t even know they could be his brothers and sisters. He has caterpillar perspective. His focus is the food he loves and nothing else, not even what will become his destiny. The interesting thing in Carle’s book is that after five days of eating almost non-stop, at the end of each day the narrator explains the caterpillar is still hungry. I should have changed my name to caterpillar. A few years ago, I would have said the same thing. I could eat a full meal and be stuffed. And when dessert came out, I could eat several pieces of that, as well. It just seemed I was never full. I was always a very hungry caterpillar. After gorging himself on the sixth day, the caterpillar has a stomach ache. The next morning he gets up and spins himself a chrysalis. The book calls it a cocoon. We won’t get technical, but that’s just wrong and besides, chrysalis is a much more elegant word. The children’s book fails tell us that in this dark tomb-like enclosure is where all the magic happens. Everything caterpillar turns into a genetic soup, except for some transformational cells placed there by the Maker. It’s in the chrysalis that the caterpillar melts. Out of this simmering caldron a new creature begins to emerge. It is a place of change or transformation no one really fully understand. Everything that used to be the caterpillar is important in this transformation. Every ounce that was him will be used to fuel the change process for the new creation which will emerge. It takes giving up every part of himself to become something new. 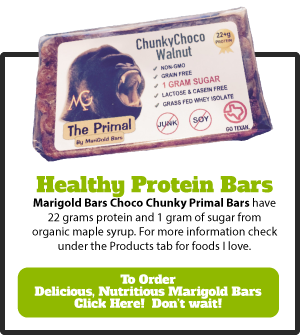 Even the foods he used to live to eat will no longer be part of his life. Everything about him will be different. Notable is that this change happens in a dark, enclosed place. 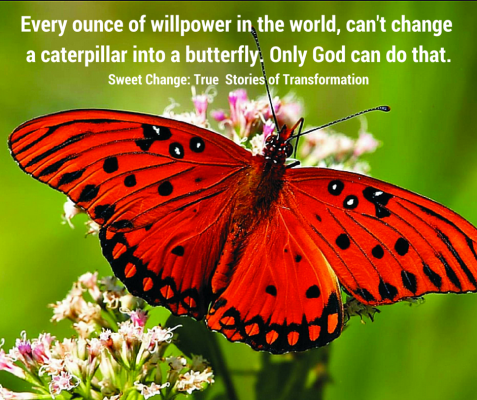 No one sees this change begin except the caterpillar and God. There’s no peek hole for the chrysalis so that we can see what is happening every day. He is surrounded for a purpose: to guard the process of change. Change for the caterpillar is a lonely, singular process. The reporter in me would like to interview the caterpillar just before he goes in the chrysalis. I’m sure going in he’s just wanting to sleep for a long time, kind of like how I used to feel after eating everything in site. Some would call this a binge. I never wanted to admit I was binging. I would do it when I was alone so no one would see. “So Mr. Caterpillar, what are you looking forward by going in the chrysalis?” I’d ask. And with that he closes up the last of the chrysalis and begins the process unaware that he prophesied what would happen when he emerges. He will be totally new, completely changed, a new creation. For the caterpillar the process is part of a life-cycle. Not much thought goes into the process. He just instinctively knows this is what comes next. 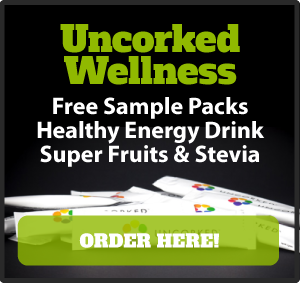 For us humans, making a such a monumental lifestyle change is a real journey of faith. Even if we have a vision of the end result, it can still be extremely stressful to give up life as we know it now and go through a different process, even if we are assured of a positive outcome. The only reason we can do it is if we know for sure God is directing our steps and showing us how to avoid the pitfalls. We know He will do this because one of His names is Faithful. It’s in that leap of faith that God catches us in His arms of grace. Is it difficult? Stepping out into untrodden territory is always difficult, but the outcome is not unknown. It takes faith to become a new creation.4 Every ounce of willpower in the world can’t turn a caterpillar into a butterfly. Only God can do that. I know this for a fact because it happened to me. I’ve lost over 260 pounds and every day He changes me a little more. Only God has the blueprints to make it happen if you have the faith to believe in His power and submit to His process. Do you? What change is He calling you to? 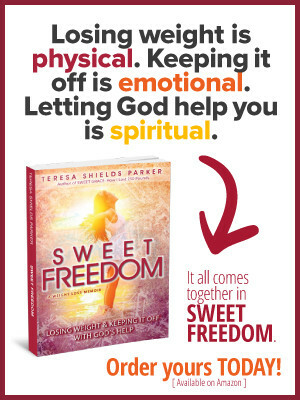 Teresa Shields Parker is an author, transformation coach and speaker. 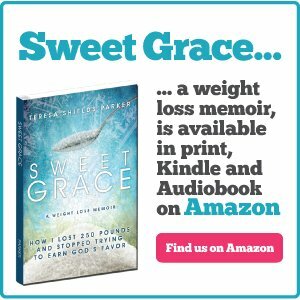 Her books include Sweet Grace: How I Lost 250 Pounds and Sweet Change: True Stories of Transformation. 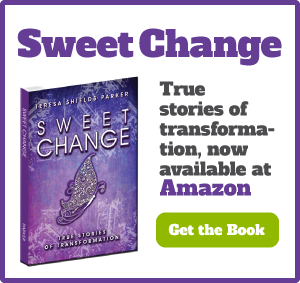 Sweet Change talks more about the power of God to help us transform into the people we want to be. Order print or kindle from Amazon or pdf from HERE. 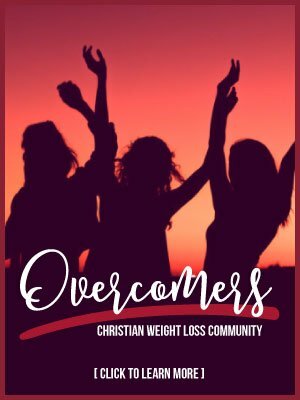 For more information on transforming your life with Teresa as your coach, find out more about Sweet Change Weight Loss Group by clicking here HERE.